Involuntary hardness, tightness or bulging in muscles is defined as muscle spasms or muscle tension. A variety of causes such as stress, hormonal imbalance, injury, or certain disease may be responsible for cramps in any area of the body. Synthetic muscle relaxants sold over the counter to relief pain act on our nervous system rather than acting on the muscular system and shuts off the communication between the nervous system and brain, and so you do not experience pain. This is why relaxing muscle pills available over the counter causes side effects such as weakness, urinary retention, constipation, dry mouth, fatigue and dizziness. Also, the effects of these prescription drugs are temporary. Long-term use of relaxing pills make you addicted and when you stop taking them you experience withdrawal symptoms such as joint pain, elevated heart rate, diarrhoea, fever, chills and high blood pressure. 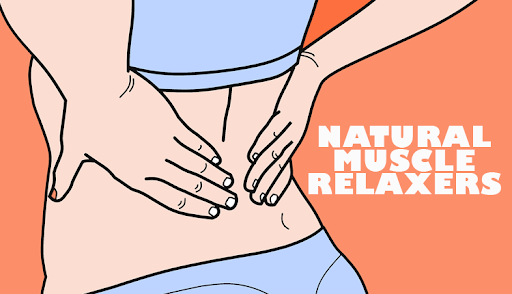 Another safe yet effective option to reduce pain and muscle tension are natural muscle relaxers. Here are top 10 natural muscle relaxers that are equally effective as prescription drugs but have no side effects. Arnica Oil– The medicinal properties of Arnica oil is known since ages. Today it is used widely to recover from muscle strains and workouts. Thymol and helenin are two chemicals present in arnica oil that reduces swelling and inflammation. Also, arnica oil boost blood circulation. Adequate blood circulation to the affected part fastens healing. Massage the affected area gently with arnica oil 2-3 times in a day directly until the oil is absorbed into the skin. Cannabis Oil- The Human brain has cannabinoid receptors. Cannabis suppresses the pain receptors in the brain. It relaxes muscles, is anti-inflammatory and thus helps to deal with pain, convulsions, inflammation and pain. Studies show that cannabis improves the immune response, sleep and concentration. Rub cannabis oil to the affected area gently and allow it to absorb into the skin. Chamomile – 36 flavonoids present in chamomile renders its anti-inflammatory property. It relaxes muscle spasms, sore muscles and also promote healing. Chamomile tea relieves menstrual cramps by relaxing the muscles of the uterus. Chamomile essential oil soothes muscle, joints and mind. *If you have an allergy to ragweed, avoid chamomile essential oil and chamomile tea. Epsom Salt– Epsom salt is magnesium sulfate heptahydrate which is a natural painkiller. After over exertion the extra fluid gets accumulated in our muscles that causes pain and stiffness. Epsom salt withdraws the accumulated extra fluid in the muscles, relieves inflammation and also heals ailments such as wounds and migraines. Magnesium through skin enters the body and stabilizes the inflammatory response. Fill the bathtub with water and add two cups of Epsom salt to it. Soak yourself in it for 20 minutes to relieve tension, detox body and for fast recovery from workouts. Cayenne pepper– Not only cayenne pepper is used in cooking to enhance the taste of spicy dishes, but it also has medicinal properties. This common kitchen ingredient is one of the best-known natural muscle relaxer and is commonly recommended to people with rheumatoid arthritis and fibromyalgia. It reduces pain and alleviates muscle cramps. Also, it has immune boosting properties, lowers the level of cholesterol and heals digestive issues. When tissue is damaged, body release a Substance P. Cayenne pepper has a direct effect on Substance P and quells the pain. Cayenne pepper dilates the blood vessels and causes the mobilization of anti-inflammatory cells to the affected muscle. Warm two tablespoon of olive oil and add a teaspoon of cayenne pepper to it. Massage the affected area with it and leave it for half an hour. After half an hour wash it off. *Never apply cayenne pepper to the irritated skin or wounds. Peppermint Essential Oil- Peppermint essential oil has menthol. The compound menthol is analgesic, antispasmodic and anti-inflammatory. It reduces swelling, inflammation and muscle pain and also improves the circulation of blood. Dilute peppermint oil with almond oil and massage over the affected area. You may also have 2-3 cups of peppermint tea in a day. You may also blend a few drops of sandalwood oil and two drops of peppermint essential oil with a tablespoon sweet almond oil and massage the affected area with this dilution. Tart Cherry juice– Overexertion causes a lot of stress on your muscles. Tart cherry juice is an ideal solution to relax overexerted muscles. It is rich in anti-inflammatory compounds and antioxidants. Studies show that the pain reduction ability of tart cherry is more effective than aspirin due to the presence of compounds flavonoids and anthocyanins. Both the compounds inhibit COX enzymes that produce prostaglandins. Prostaglandins cause inflammation and pain. Drink cherry juice for post-run pain or post-workout pain. 8. Lemongrass essential oil- Lemongrass essential oil has a soothing aroma. It improves blood circulation and relieves ailments such as aches, sprains, menstrual cramps, leg cramps and spasms. It contains chemical limonene that is anti-inflammatory. Dilute lemongrass oil with olive oil or almond oil and massage gently over the affected area with it. 9. Rosemary Essential Oil– Rosemary essential oil contains abietane type phenolic diterpenes. The compound acts as an antioxidant and treats muscle pain and arthritis. It also reduces muscle tension. The compound antinociceptive present in rosemary essential oil inhibits pain receptors and promotes relaxation. Add a few drops of rosemary oil to warm compress and press it to the affected area. The tight muscles will loosen and stretch. 10. Catnip– Studies show that the chemical present in catnip nepetalactone has an intoxicating effect on cats. In humans too the smell of catnip calm nerves, relieves anxiety and relaxes the body and mind. Catnip is a herb that is known to facilitate relaxation thus it acts as a natural muscle pain reliever and muscle relaxer. It is antispasmodic, anti-inflammatory and soothes the nervous system. Nepetalactone present in catnip acts as natural tranquilizers. Catnip tea relieves menstrual pain. It also alleviates a headache that is caused due to soft tissue injury or tension. 11. Blueberries– Being an excellent source of polyphenols and antioxidants blueberries are anti-inflammatory. Studies show that blueberry supplementations decrease the inflammatory markers. It is helpful in relaxing the muscles and receiver after the exercise. Have blueberry smoothie before and after the exercise to accelerate the recovery after muscle damage. 12. Peppermint tea– Peppermint is rich in menthol that offers it anti-inflammatory, analgesic and antispasmodic properties. It promotes the circulation of blood and reduces spasm and pain. Drinking peppermint tea reduces swelling eliminates inflammation and relieves pain. It treats a backache, headaches and sore muscles. 13. Curcumin- Curcuminis present in turmeric ginger and cinnamon. It is anti-inflammatory. Research shows that curcumin reduces the inflammatory markers after the exercise. Incorporate turmeric, ginger and cinnamon in your diet. You may also take curcumin supplements after consulting your doctor to relax muscles. *Pregnant and breastfeeding females should not consume too much curcumin. Dear readers why to depend on over the counter muscle relaxants to relieve muscle spasm and pain when you have a natural and more effective option. But yes, to make natural muscle relaxers work stay hydrated, take adequate rest, cut the intake of sugar, caffeine, alcohol or trans-fats and eat foods rich in protein, calcium and magnesium. Foods rich in calcium are dairy products, fox nuts, green-leafy vegetables and eggs. Magnesium is required by the body for normal functioning of nerve and muscles. Foods rich in magnesium are almonds, legumes, bananas and brown rice. Besides this avoid overexertion and do gentle stretching exercises every day. *Natural muscle relaxers should be used as the first, natural line of treatment. We can not replace conventional medicines altogether. In case of incapacitating pain, or if the particular pain is severe, contact your health care provider for proper diagnosis and treatment of the underlying cause.